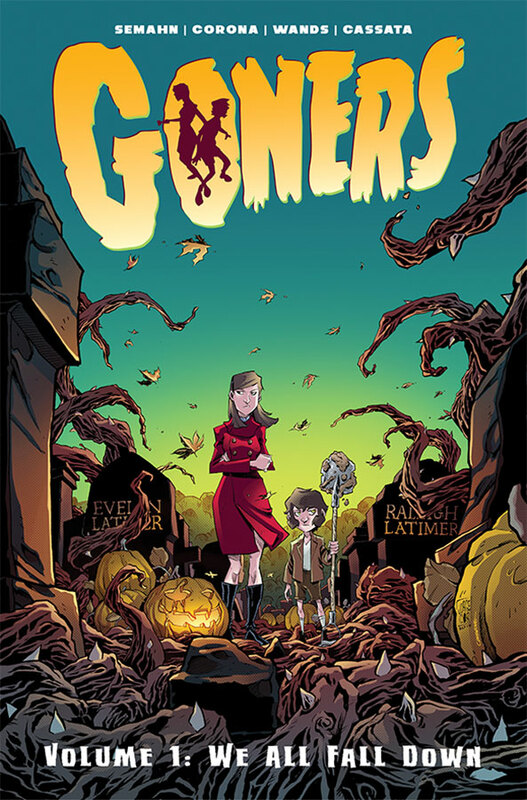 Goners Volume 1 – We All Fall Down collecting issues 1 to 6 of the Image comic series featuring the Latimer family written by Jacob Semahn who co-created it with artist Jorge Corona with ink and letters by Steve Wands and colours by Gabriel Cassata with water colors by Morgan Beem is a fun horror comic filled with lots of adventure. The Latimer family has parlayed their dealing and hunting of the paranormal into a profitable family business. But everything is coming to fruition on one night, when the family comes under assault, and a long-planned game comes to an end with the Latimer kids, Josiah and Zoe right in the crosshairs. Funny, packing an emotional punch and filled with a great, animation style of art, this is a series to watch. Everything ties together, things hinted at in the first issue pay off by the end of the sixth, and sets up the rest of the series (if there is one) really nicely. 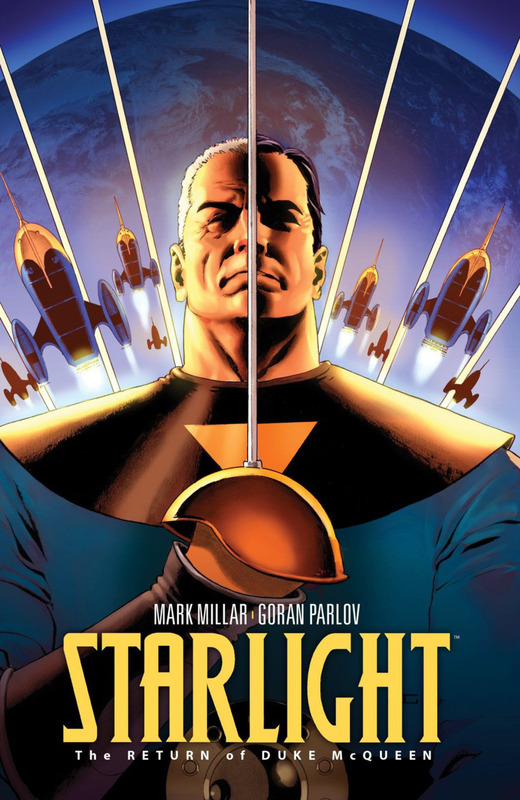 Starlight: The Return of Duke McQueen, trade paperback. Writen by Mark Millar, who is quickly becoming a favourite of mine, with art by Goran Parlov, colors by Ive Svorcina and letters by Marko Sunjic, this story is just about perfect. It takes the following posit – What would happen if Flash Gordon came back to earth and lived a normal life and no one believed him about his adventures? That’s the launch point for the story of Duke McQueen, who is mourning the loss of his wife and missing his kids. He’s tired, and not sure what to do with his twilight years, the local kids make fun of his claims, and his own can’t make time for him. It’s a bit of a sad, but very real existence until a spaceship lands on his lawn – the planet he once saved needs his help one last time. It pays perfect homage to the sci-fi heroes of yesteryear (there are some familiar looking ships in the hanger bay), and I love the fact that the hero this time around isn’t some young kid, it’s a seasoned, older man, who may not be the man he once was, but still has a heart for adventure… A great read! 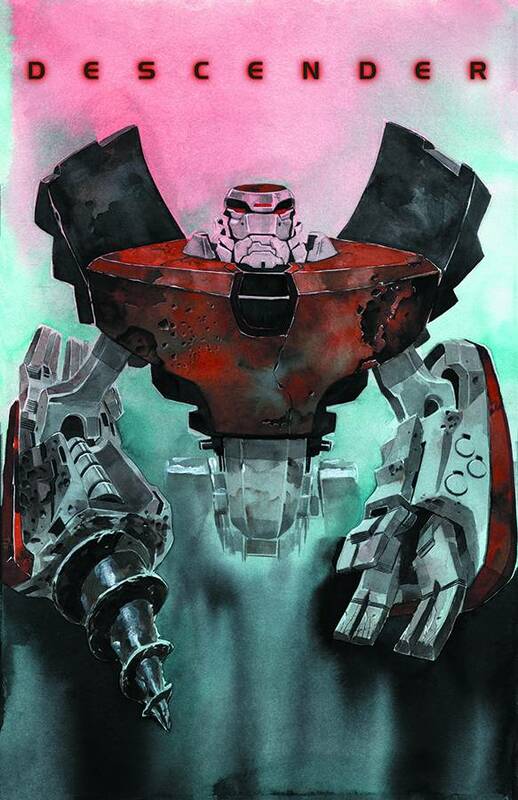 Descender Issue 4 This science fiction tale written by Jeff Lemire and co-created with artist Dustin Nguyen, with letters and designs by Steve Wands is completely engaging. Kirk had given me issue 1 awhile ago, and I’m said to say it slipped off my radar, but catching up on all the issues in one go, brings the story to life in a great way. A young sentient robot, Tim-21, and his companion bots, Bandit and Driller, live in a universe where robots are hated after an attack by giant robots known as Harvesters a decade ago. These Harvesters share a coding with the recently reactivated Tim-21, and every one wants him, from Scrappers to the Government who is trying to figure out his connection with the decade old genocide. I’m not always sold on the art in this story, but I’m pretty plugged into the system and the world, and the developing politics we’re seeing… Another winner from Image. The Chrononauts Issue 4. And somehow it’s over already. This brilliant, and fun series written by Mark Millar ad co-created with artist Sean Gordon Murphy, with colors by Matt Hollingsworth and letters by Chris Eliopoulos finished this week. 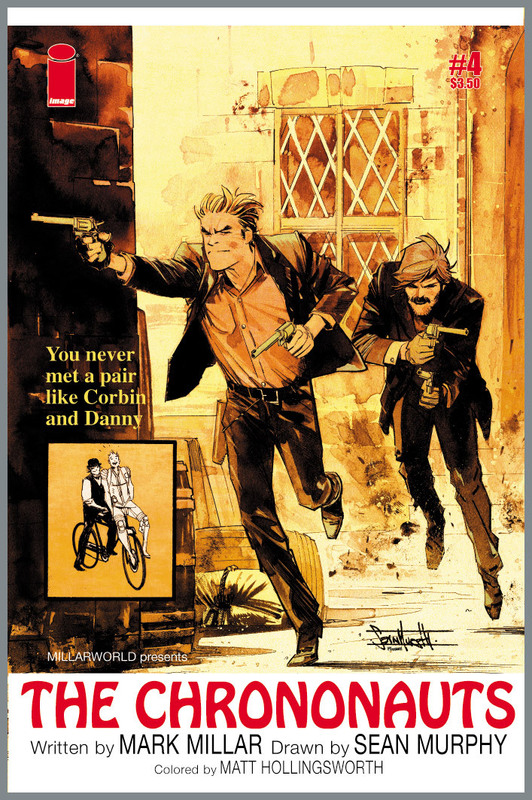 LOVED THIS SERIES (and the Butch and Sundance cover)! And of course as illustrated above, I’m working my way through more of Millar’s stuff. Do you have a fave? 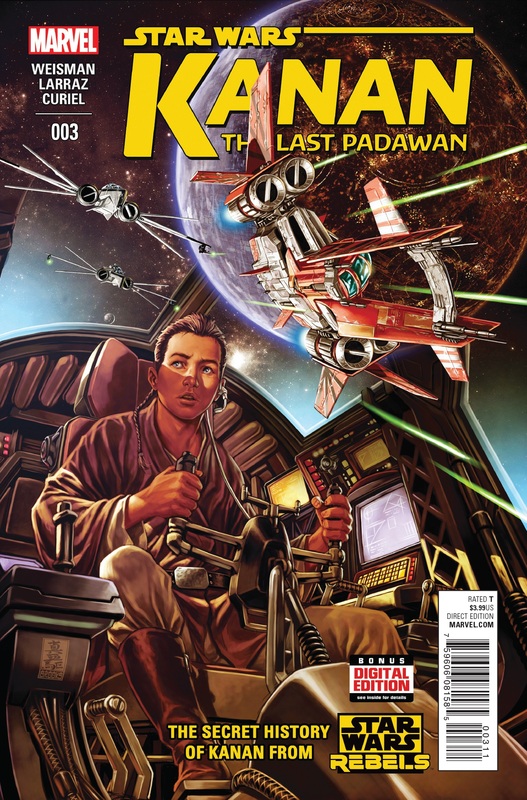 Star Wars: Kanan The Last Padawan Issue 3. Greg Weisman as writer, alongside artist Pepe Larraz, with colours by David Curiel and letters by Joe Caramagna continue to expand the back story of Rebels’ Kanan, when he was still a young padawan named Caleb Dume trying to survive after Order 66 wiped out the Jedi. 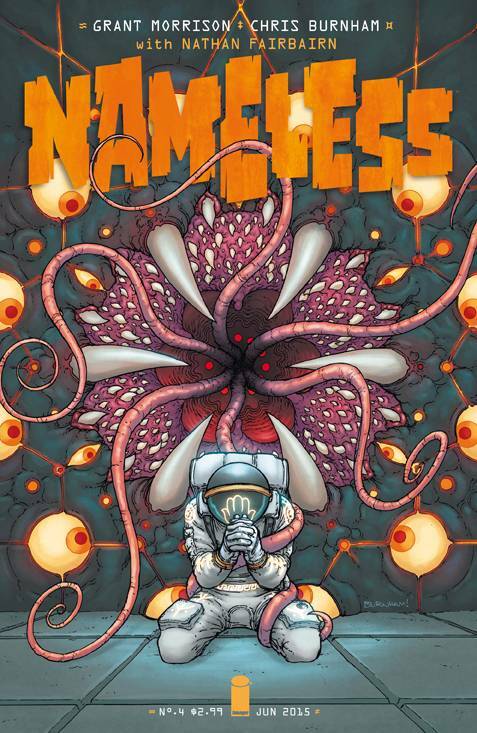 He’s still on the run, but eventually forms an uneasy alliance in this issue with Janus Kasmir, who may actually help him survive, teach him to live on the edges, and get by in a galaxy that seems to want him dead. I love the art, and watching the Empire continue to seize control as this young man tries to find a way to live… Keep it up Marvel, these Star Wars titles haven’t disappointed yet! 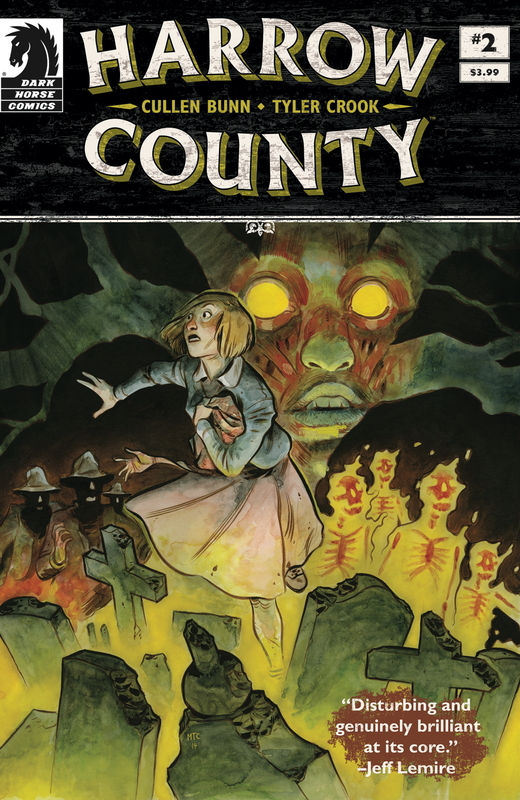 Harrow County Issue 2. This tale from writer Cullen Benn, with arts and letters by Tyler Crook just gets creepier as it progresses, with the haint in her possession, young Emmy hears the towns people, including her father, gathering at the old tree on her property, to discuss the past, and the seemingly unavoidable future for young Emmy. Spooky stuff. And I am loving it! So if you’re down in my neck of the woods, check out West End Comics on Queen Street, say Hi to Kirk, and tell him I sent you!